Former Chair of the Commission on Human Rights and Administrative Justice (CHRAJ), Justice Francis Emile Short is concerned the Akufo-Addo government has not done much in the fight against corruption, almost a year in office. 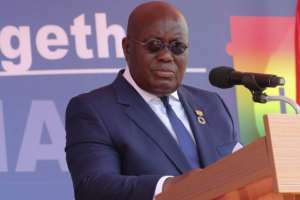 The President, Nana Addo Dankwa Akufo-Addo has been criticised by a section of the public, especially supporters of the governing New Patriotic Party for not taking action against people in the previous government accused of corruption. Commenting on the disappointment, the Senior Minister, Yaw Osafo Maafo said the government does not want to jump into prosecuting people when facts and evidence to back what they are alleged to have done have not been established. “...we don’t want to do this in a hurry, we must do thorough investigation…we must do it in such a way that people who have wronged the system are identified through thorough investigation and they will answer for their crimes,” he said Monday at the launch of the National Anti-corruption and Transparency week in Accra. Although Justice Emile Short appreciates the Senior Minister’s position for the need for the state to conduct thorough investigations into the allegations before it initiates prosecution, he said, some of the cases could commence by the Attorney-General and the Director of Public Prosecutions. He is unimpressed with the efforts made so far and called on the government to do “something drastic to deal with this canker of corruption.” A lack of prosecution on several of the reported cases “sends a wrong message to the public,” he noted. “There is the need to deal with corruption cases expeditiously and I don’t think we are seeing that,” he argued while advocating a massive national support for the fight just as was done in the fight against illegal mining commonly called ‘galamsey’.